May cause false (+) glucose test with Clinitest, Benedict’s or Fehling’s soln. Potentiated by probenecid. May increase risk of rash with allopurinol. 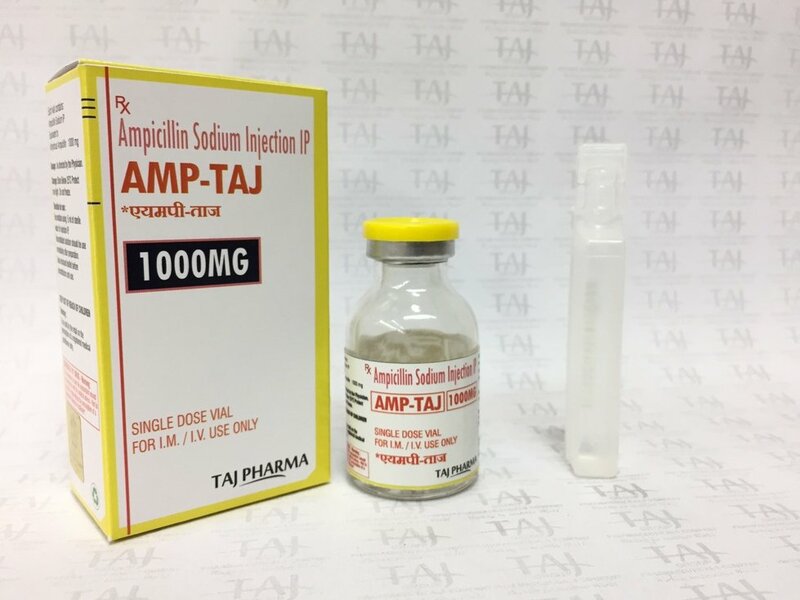 Ampicillin injection is used to treat certain infections that are caused by bacteria such as meningitis (infection of the membranes that surround the brain and spinal cord) and lung, blood, heart, urinary tract, and gastrointestinal tract infections. Ampicillin injection is in a class of medications called penicillins. It works by killing bacteria. Antibiotics such as ampicillin injection will not work for colds, flu, or other viral infections. Taking antibiotics when they are not needed increases your risk of getting an infection later that resists antibiotic treatment. Ampicillin injection comes as a powder to be mixed with fluid and injected intravenously (into a vein) or intramuscularly (into a muscle). The frequency and length of your treatment depends on the type of infection you have. You may receive ampicillin injection in a hospital or you may administer the medication at home. If you will be receiving ampicillin injection at home, your healthcare provider will show you how to use the medication. Be sure that you understand these directions, and ask your healthcare provider if you have any questions. You should begin to feel better during the first few days of treatment with ampicillin injection. If your symptoms do not improve or get worse, call your doctor. Use ampicillin injection until you finish the prescription, even if you feel better. If you stop using ampicillin injection too soon or skip doses, your infection may not be completely treated and the bacteria may become resistant to antibiotics. Ampicillin injection is also used in some pregnant women to prevent passing an infection to the baby during birth. Ampicillin injection is also sometimes used to prevent infection in people who are having certain types of surgery. Talk to your doctor about the risks of using this medication for your condition. tell your doctor and pharmacist if you are allergic to ampicillin; penicillins; cephalosporin antibiotics such as cefaclor, cefadroxil, cefazolin (Ancef, Kefzol), cefdinir, cefditoren (Spectracef), cefepime (Maxipime), cefixime (Suprax), cefotaxime (Claforan), cefotetan, cefoxitin (Mefoxin), cefpodoxime, cefprozil, ceftaroline (Teflaro), ceftazidime (Fortaz, Tazicef, in Avycaz), ceftibuten (Cedax), ceftriaxone (Rocephin), cefuroxime (Zinacef), and cephalexin (Keflex); any other medications; or any of the ingredients in ampicillin injection. Ask your pharmacist for a list of the ingredients. tell your doctor and pharmacist what other prescription and nonprescription medications, vitamins, nutritional supplements, and herbal products you are taking or plan to take. Be sure to mention any of the following: allopurinol (Aloprim, Zyloprim); other antibiotics; oral contraceptives; and probenecid (in Col-Probenecid, Probalan). Your doctor may need to change the doses of your medications or monitor you carefully for side effects. tell your doctor if you have mononucleosis (a virus also called ‘mono’) or have or have ever had allergies, asthma, hives, or hay fever. tell your doctor if you are pregnant, plan to become pregnant, or are breastfeeding. If you become pregnant while receiving ampicillin injection, call your doctor. Keep all appointments with your doctor and the laboratory. Your doctor may order certain lab tests to check your body’s response to ampicillin injection. If you are diabetic and test your urine for sugar, use Clinistix or TesTape (not Clinitest) to test your urine while using this medication.